In the Churchill Wildlife Management Area around the Hudson Bay in Manitoba, Canada, this close knit Polar Bear family bonds. A Polar Bear cub nibbles on the fur around the neck of its mother as she keeps a close eye open around the Churchill Wildlife Management Area in Hudson Bay, Manitoba for any signs of danger. 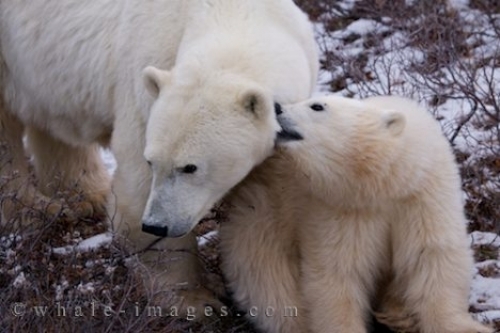 A mother Polar Bear will protect her family and if she feels threatened by humans or other wildlife, her aggressiveness will be the first signs you will see. When the Hudson Bay forms pack ice, this family will head to the shores of the Hudson Bay and the mother will teach her cub the lessons of life. The cub will learn how to catch its own food using the proper techniques and all tricks required to survive the winter around Churchill, Manitoba. The mother will feed its cub until it reaches two or three years of age and then it is set free to survive the wilderness on its own. Usually a family consists of a mother and two cubs but the survival rate is not that high as approximately six out of ten Polar Bear cubs die within their first year. This is not always the fault of the mother as an adult male Polar Bear is sometimes on the lookout for cubs, starvation is another factor or simply an accident may have occurred. As this Polar Bear cub grows, starvation is still a high risk death problem and for those bears that make it to adulthood, they have successfully mastered all the survival skills. The only real danger that they face from then on is humans or the possibility of a serious fight with another adult Polar Bear. While on a Tundra Buggy tour around the Churchill Wildlife Management Area, we were lucky to capture this Polar Bear family at close range. The cub minds his own business and continues to play while the mother stays extremely close to her young. The Tundra Buggy tours become very busy during the arrival of the Polar Bears and if you are traveling to Churchill, Manitoba for a glimpse of them, book well in advance. The later in the season that you can book, the more eventful your adventure will be. The middle of November is usually a good time to see the Polar Bears as the pack ice is not quite thick enough for traveling. The majority of them are still lingering around the shores of the Hudson Bay in Churchill, Manitoba especially those mothers tending to their cubs.